Hi everyone! Today is the fourth stop on the Giller Light Bash 2015 Blog Tour! Giller Light Bash 2015 is next week and it helps support Canadian Literature and the Frontier College. I hear that there is also going to be an actual red carpet and essentially, a fun night for all book lovers! You can still get tickets -> here! This blog tour is meant to highlight the five short listed books for the Scotiabank Giller Prize! Yesterday's post was by Jessica over at Not My Typewriter, where she reviewed Outline by Rachel Cusk - you can see the post here. 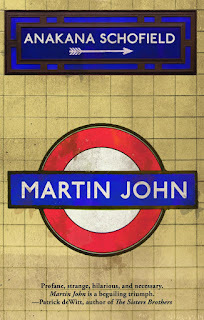 For my post, I will be reviewing Martin John by Anakana Schofield. Most people might know Schofield from her previous award-winning novel, Malarky. The Premise: Martin John's mam says that she is glad he is done with it. But is Martin John done with it? He says he wants it to stop, his mother wants it to stop, we all want it to stop. But is it really what Martin John wants? He had it in his mind to do it and he did it. Harm was done when he did it. Harm would continue to be done. 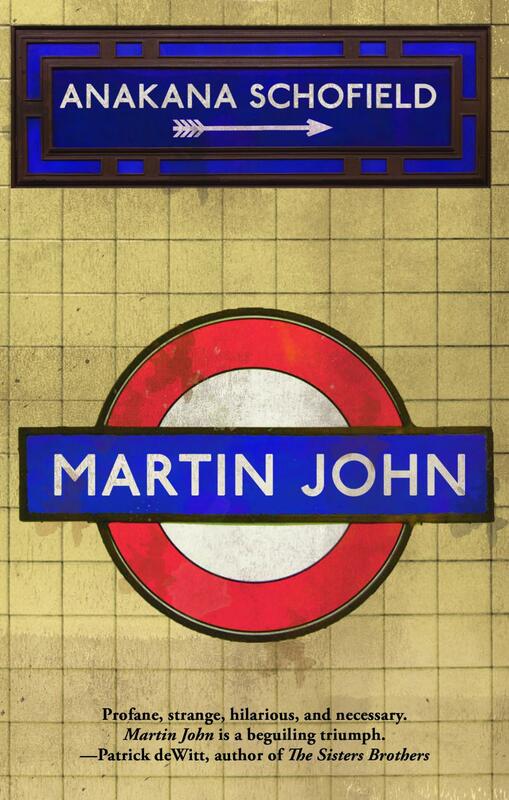 Who will stop Martin John? Will you stop him? Should she stop him? [excerpt from Biblioasis] - I thought it might be better to have that excerpt from the publisher to kind of set the premise for the book. It follows Martin John, a character that is clearly troubled and his part in "it" -- which is never defined for the character. In this strange, mysterious and uncomfortable read, Schofield takes the reader into the mind of a man that might fear many. My overall thoughts and review: To begin with, the design and structure of this book was what I found instantly intriguing. I was curious to see how the rest of the story would unfold and if there was a reason for having only a few sentences on a page, small bullet points and fragmented conversations. The reader is immediately introduced to Martin John, who has done it and essentially harm is done. It is never defined to the reader or said directly, but it becomes clear as you move forward in the book what Martin John has done and who he is exactly. For those unsure whether or not to take the plunge and want to know more about the book, Martin John is a sexual offender. The book takes us into the mind of this very disturbed man. Schofield is clearly writing from the perspective of not wanting the reader to have empathy or sympathy for Martin John, but rather to allow the reader to have an understanding of him and his motives. I'll be honest, the book definitely made me more uncomfortable as I read on and discovered that he was a sexual offender and there were scenes that really made me want to put the book down. I thought from the very beginning that it, had to do with murder, which definitely would be a bad thing as well. But I guess, I was a little surprised. It is definitely a taboo topic and Schofield works in such an interesting way that she does not offer the reader all the details, but rather the pieces of the puzzle to put together and simultaneously making the reader uncomfortable as if she offered all the details. The text definitely made me uncomfortable because at times, you feel conflicted because you want to have a deeper understanding of the mechanics of this disturbed individual, but also because it shows the harsh reality of the mental health system. Sexual offenders are a taboo topic in literature and usually it is from the perspective of those who were affected by them. Furthermore, some believe that rehabilitation is simply not possible. The reader gets an inside look in some moments about how the psychiatric system handles individuals like Martin John and in a way, gets to see how the system can sometimes fail individuals like Martin John. I think that it was incredibly brave of Schofield to tackle such a dark topic and although the text certainly does not warrant any sympathy for the character of Martin John, I closed the book with a deeper understanding of all the nuts and bolts in the mind of Martin John. I also think the book encourages more discussion surrounding the topic of sexual offenders and the mental health system. The book definitely made me uncomfortable about 90% of the time, but like Patrick Dewitt said, I am in agreement that it is a "necessary" text to bring about further discussion. Be sure to check out Jenn's post tomorrow on Arvida over at Lost in a Great Book! Disclaimer: I received a review copy of this book for my participation in the #GLB2015 Blog Tour for consideration/review. All opinions are my own.